Our first CotM out of Finland introduces a similarly surprising first as our featured catfish for April 2005, Planet Catfishes foremost Finn, Mika Kaukonen turns the spotlight on the infamous Trichomycteridae family and about time too - it is most surprising to note that in over 100 CotM articles, this is the first to feature a representative from this family. The infamy and perhaps some reticence on the part of fishermen to trade in these fish comes from their legendary reputation for parasitism. Much myth surrounds rare cases of certain species entering the urinary tracts of swimming mammals, including man! These parasites confuse those warm-blooded body parts with their natural target; namely the gills of large Pimelodidae catfish. They are known to have evolved to parasitize such hosts by living in their gill chambers to feed. To general relief, the majority of species belonging to this family do not live this way. Usually they are harmless and quiet catfishes requiring little special attention other than peace and quiet. To the displeasure of the catfish enthusiast, a breed of aquarist who typically seeks out the uncommon or weird, they are very rarely imported other than by accident or as contaminants. Perhaps this lack of exposure is further underlined by the amount of taxonomic work that has also been carried out on what seems to be a less than well-known family of fishes. The All Catfish Species Inventory lists 42 valid genera, 176 valid species and 55 known or estimated species. The family has been, however, subject to an active body of scientific work in recent years. In 2004 alone, 18 new species were described; this shows no sign of abating as I write this article. 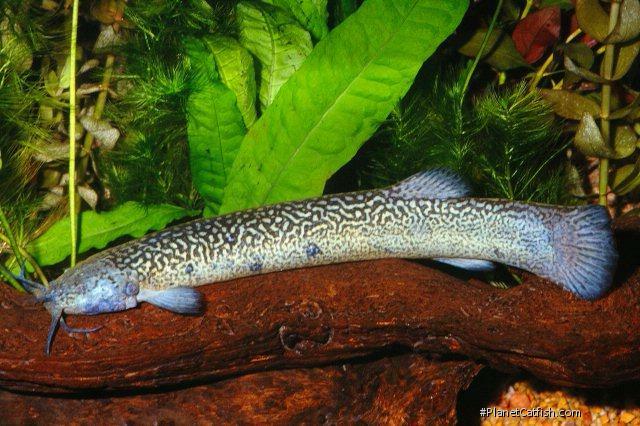 Eremophilus mutisii is representative of the whole group in every positive and good way. It has colour, looks and a nice attitude. The basic colour is an attractive looking olive green with a subtle yellowish tint, and there are ornamental markings. To my eyes they are like sausages without adipose and ventral fins. This is what has been considered as a distinguishing character from the similar genus Trichomycterus. It is, at present, placed in the largest of the many subfamilies of the Trichomycteridae, the Trichomycterinae, but that is (according to some authors) questionable. My involvement with this catfish began at the end of 2001 when a Finnish aquarium wholesaler received 30 of them. At the time they were very rare in European shipments and to my knowledge this situation has not yet improved. This is in fact one of the few catfishes that were imported into Finland before it appeared in Germany. By the time of import, the German Wels Atlas 1 was published and, sadly, E. mutisii didn't quite make it in there. The imported species arrived in bad shape. They did have some pale patches and "wounds" on their skin. A few of them survived and I received five of those, later buying a sixth. They did well in a 63 litre quarantine tank before moving to larger surroundings, where the marks on their skin did disappear in good conditions. They readily accepted red mosquito larvae and other frozen foods. Eremophilus were very sociable. Though I provided several hiding places for them, they all insisted in trying to go to the same plastic tube. I carried out water changes every other day and kept the water clean and warm. Over the course of keeping these fish I did notice that these pale patches (that sometimes turned to what appeared to be an open, aggravated wound) reappeared if water chemistry wasn't good. These fish didn't allow you too skimp on any basic aquarium routines. I now think that this may have been an intraspecific disease; no other fishes in the same aquarium suffered whatsoever. Eremophilus mutisii is a peaceful catfish and very slow in its movements. Other fishes can easily harass them. In their natural habitat they are almost the only fish species present, so they have few defence abilities. Due to this I recommend housing in a species aquarium. I kept them with groups of Glyptothorax lampris and Olyra longicaudata. Not a great biotope tank, but as all of these species ignored each other, everything went fine - and that's more important. I was able to enjoy keeping these fish for two years before the last one died; largely due to some bad moves from me. During a two week summer vacation without water changes, the disease symptoms appeared again, this time, fatally. They are very beautiful catfishes. I recommend them to everybody who is willing to attend to the species' needs and give them the proper aquarium they need. Anyone who enjoys quiet and tranquil aquariums should try this one. I will - if I ever get a second chance. Etymology Eremophilus: From the Greek, eremos, meaning solitary and philein, meaning to like; in reference to the secretive nature. Identification Eremophilus differs from the similar, but much larger genus, Trichomycterus mainly by the absence of ventral fins. Sexing Females are much fuller and have rounder bellies. This is easier to compare amongst a group. General Remarks An excellent food fish, which was introduced to the Ubate, Chiquinquirá and Tundama valleys. It is the only species of food fish that has been able to survive competition from introduced trout and carp species. Other Parameters Will withstand cooler or warmer temperatures for a short period of time. They don't like very strong current in the aquarium and seem to enjoy much more calmer surroundings. Feeding Requires a good supply of frozen foods. They don't seem to accept any dry foods. Homemade foods containing vegetables, shrimps and other food stuffs is accepted. Furniture Fine sand is best and it is better to avoid sharp objects in aquarium as their skin is very delicate and prone to scratches. Oak leaves or other tree leaves at the bottom gives an aquarium very natural biotope look and offers many welcomed hiding places. Compatibility Not a true parasitic catfish, Eremophilus are very quiet and peaceful. You should never house them with rough and territorial company. They don't bother anybody or do not try to hunt down even the smallest of fishes. Suggested Tankmates Corydoradinae, Bunocephalus and peaceful shoaling midwater tetras.